I read an earlier fantasy novel (The Catswold Portal) wherein a portal leads to a world of shapeshifters who can turn into cats and their relatives above ground. 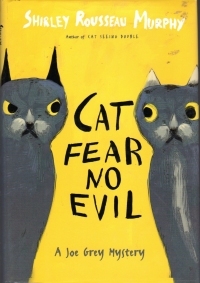 In researching the author, I learned she also had a mystery series with a talking cat. The Joe Grey series. This is one of the books, the ninth in the series, published 12 years after The Catswold Portal. And instead of looking like the latter was a standalone book, some of the mythos from it are creeping in. At any rate: Joe Grey nominally belonds to a guy who lives in a small town in California, and Joe has been helping the police solve crimes because he and a couple other cats in the area can talk and reason like humans. In this case, they look into a case of identity theft and some very particular burglaries up and down the coast where a specific collectible item was taken while many other valuables are left behind. Then, a bad cat from previous books comes around without his former human accomplice. With whom is the giant black tom working now? That’s the setup, and as the book goes on, we discover there’s a shapeshifting cat woman in the stories as well as lore, mysterious jewelry, and research done at the Cat Museum. So perhaps the series started out independent of the fantastic elements from The Catswold Portal, but by book 9, they’re working into the mythos. The book carries a lot of series business, with subplots unrelated to the main plot of this book but continuing the story arcs of people in the books. And the writing is not high fantastic as the pure fantasy novel, but it has tendencies to be especially lush in places. Particularly in the description of what everyone is wearing in every scene. There’s a lot of jump cutting and time shifting in the book, where one scene picks up a little earlier from the last but from a different person’s perspective. This narrative style combined with the series business and the overdone descriptions and conversations make this book longer than it should be, but if you’re really into the series and the characters, perhaps it’s just what you want. But it’s not really what I’m looking for in genre fiction, so I’ll probably leave it alone. Unless I find a trove of them at a book sale, cheap. In which case I will forget my reservations and buy them for a time when I don’t remember that I didn’t like book 9. Maybe reading them in order would build it up more. I dunno.